BOSTON, MA - Oct 30, 2018 –FOUR PAWS International, together with the Albanian Ministry of Tourism and Environment, yesterday evacuated 11 neglected wild animals from the Safari Park Zoo in Mbrostar in Fier County, Albania. Through a relationship with FOUR PAWS’ Boston, Massachusetts office, a supporter, moved by the animals’ conditions, decided to fund the rescue. American businessman, Eric S. Margolis, donated funds for the mission in memory of his mother, Nexhmie Zaimi. Mrs Zaimi was born in Albania and lived recently in the U.S..
Over the weekend, an international team of veterinarians as well as a special command of the Albanian police supervised the rescue mission. FOUR PAWS brought the animals – including three lions and a three-legged bear – temporarily to a zoo in Albania’s capital Tirana. As soon as the animals have recovered, FOUR PAWS will transfer them to species-appropriate sanctuaries. Due to safety reasons, the owner of Safari Park Zoo was not informed in advance about the confiscation of the wild animals. In a dramatic turn of events, the police had to break the entrance gate to give the almost 20-person FOUR PAWS rescue team access to the zoo. “What we saw was shocking: dirty little concrete enclosures with desolate animals inside. The animals are all in bad conditions. Lenci the lion suffers from a proliferation on the conjunctiva of his left eye that needs to be treated. 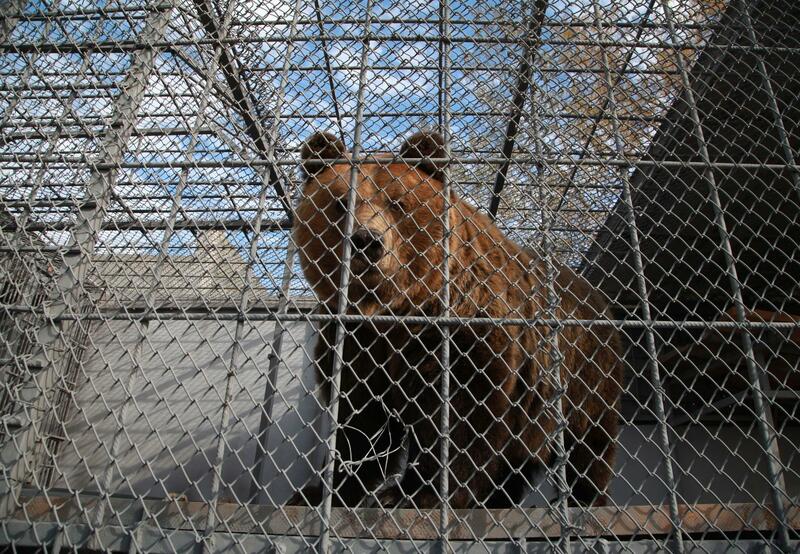 The three-legged female bear, Dushi, is very emaciated and has clear behavioural disorders." The top priority was to get the animals to a safe place as quickly as possible, therefore, FOUR PAWS temporarily transferred the three lions, the three-legged bear, the zebra, the fox, the waterbuck, the red deer and the three fallow deer to the zoo in Tirana where new enclosures for the rescued animals were built. Originally, 12 wild animals were on FOUR PAWS’ rescue list, however, the tortoise could not be found. As is common practice in wild animal transfers, the team of veterinarians sedated the zebra and loaded him for transportation into the horse trailer. During the transfer he was fully conscious, however shortly after being released into an enclosure at Tirana Zoo, the zebra died unexpectedly.